Clark Ashton Smith’s unique take on science fiction, fantasy, and horror is given life by a chorus of voices, performing 25 of his earliest works, including "The Abominations of Yondo", "The Monster of the Prophecy", "The Last Incantation", and the title story. This first of five volumes of edited and curated "preferred texts" of Smith’s work serves as justification for a re-appreciation of this master of speculative fiction, the third member of the Weird Tales unholy horror trinity, the other two being H.P. Lovecraft and Robert E. Howard. Smith’s appreciation for human sexuality, fondness for ribald humor, and strong female characters are all on display in mind-engaging, goose bump-inspiring short and unsettling stories. ©2006 The Estate of Clark Ashton Smith (P)2013 Audible, Inc. 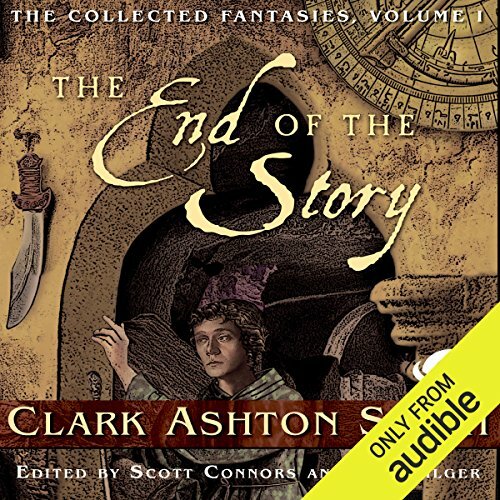 I'm a big Clark Ashton Smith fan, and this book is full of excellent performances from everybody involved with the exception of some of the accents. I rated the story a 3 because I don't really see these as what somebody would normally think of when it comes to his work. Not as much weird, macabre, fantasy, or dying earth style themes that practically drip off of some of his other work. There's enough quality in the writing that it's still worth listening to, and they're some excellent stories peppered in there, but I wouldn't rate it higher than 3 stars for story in comparison to other collections of his work. What did you like best about The End of the Story? What did you like least? If you are wanting more after going through Lovecraft well this is you man! It almost as if they talk the same language. Very nice stuff with good reading. I would love to see each of these stories in film. Especially the venus stories. Where does The End of the Story rank among all the audiobooks you’ve listened to so far? here is a variety of different science fiction stories. It reminds me of when I used to get the monthly Asimov's and other sci-fi magazines. Good for any CAS fan. While not a definitive tome of Smith's writing prowess, this sundry collection offers several diverse stories that showcase his literary range. If you could sum up The End of the Story in three words, what would they be? I knew I would like this book, but I was surprised by how much I loved it. Highly recommended for all lovers of old school Weird Tales authors. Wonderful collection of Ashton's tales. Clark Ashton Smith is in a class of his own. Enter the bizarre, weird, fantastical, adventurous, and freaky world of Ashton's imagination. You will not be disappointed. This collection was performed well. The stories themselves are great. A great value for those who enjoy H.P. Lovecraft etc. Some of the stories felt a bit incomplete, but that is understanable for what is being presented. Much of this is full and wonder of the fantastic and weird.